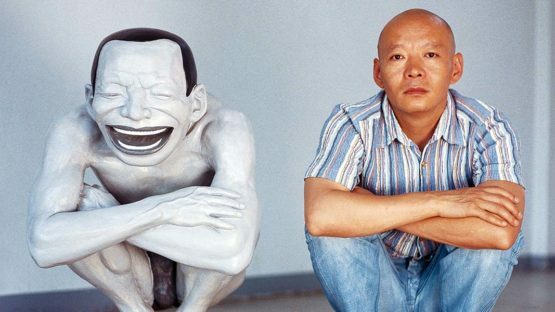 Widely considered to be one of the most humoristic and unique artists that emerged from China in recent decades, Yue Minjun is a Beijing-based painter and sculptor that uses the same motif in every single piece he creates – his own face, usually pink and frozen in a state of hysterical laughter. His self-illustrations are arranged in various settings, some ironically usual and some far from ordinary – like a scene placed amidst a Jurassic period with two Juis laughing their hearts off beside a BMW, or a bunch of giggling Minjuns shooting another bunch of Minjuns who also have wide smiles on their faces. This artist primarily works in oil but has been also recorded using prints and watercolors, as well as the aforementioned sculptures, always maintaining his laughing face leitmotif. Minjun was born during the year of 1962, in a town of Daqing, a city in the west of Heilongjiang province of China. For the majority of his life, Yui’s father worked in the oil fields of northeast China, so naturally his son also spent many working days alongside him. However, Yue departed the world of the oil industry in order to begin his studies in art during the year of 1983 when he entered the halls of Hebei Normal University. Although he was a good student, Minjun did not truly manage to find his own style despite tirelessly trying to do so. However, this all changed in 1989 as he visited the China / Avant-Garde show in Beijing, an exhibition centered around paintings of Geng Jianyi – in them, the artist depicted his own laughing face and turned that into the main motif of the works. Inspired by such a concept, Minjun decided he would use the same idea, but due to the political state of China at the time, he was forced to move to a colony outside Beijing in 1990. There, Yue had all the time and space to slowly develop his visuals – the signature style that made him famous came to be from Minjun’s depictions of his bohemian friends also present in the colony. He quickly earned recognition of art pundits for his portraits, whilst the paintings of his own smiling visage, often cloned on numerous figures, gained him incredible critical acclaim and led to numerous international exhibitions of his work. Interestingly enough, Yue’s style did not stop evolving after he became famous – instead, it kept on rapidly developing without playing it safe, constantly presenting the audiences with new concepts and settings, whilst maintaining a very dynamic relationship with the viewers. Minjun did so by continuously adapting his work to current political and social circumstances of his nation, as well the situations from the rest of the world on some occasions. Yue Minjun and his artworks have often been classified as a part of the famous Chinese movement that started out in the year of 1989 – the Cynical Realism. Although many of the aspects this movement holds dear can indeed be found in the compositions of this artist, Minjun uncompromisingly rejects this label and insists that his art is a unique moment in history, unclassifiable to any registered style. However, Yue has also stated that he does not really concern himself about what people call him, so it’s reasonable to assume he does not find the Cynical Realism connection an unrealistic one, but rather a not perfectly fitting one. As was said before, Yue Minjun’s style never stopped evolving and adapting ever since it was formed during the years of 1989 and 1990 – instead, it made a habit out of reflecting current situations mostly surrounding the nation of China. Yue often challenged these social and cultural conventions by incorporating objects and even political issues in a radical and abstract manner, placing his smiling image in the midst of the composition. Using the exaggerated expressiveness of cartooning and the stylistic rendering of graphic illustration, Yue depicts his cloned doppelgangers as contorted and grotesque, all scalded pink skin and maniacal toothy cackles. These unique figures are a clear denotation of violence and vulnerability in most of his images, as Minjun uses them as both antagonists and anti-heroes, depending on the pieces circumstances. Although his themes are always somehow indicating the state of China and his laughing face motif was adopted from a fellow painter of the same country, Yue also bases many of his compositions on well known European masterpieces. By doing so, Minjun subverts the grandiose aura of art history at the world level, relying on his aesthetics with a strong pop note – another western influence – to do the job. Although China has presented us with some incredible artists in recent decades, Minjun truly manages to stand out from such as impressive crowd – mostly due to his sense of humor which is unrivaled, but also his instinct for depicting the right social moments and clever ways of incorporating them. Yue’s printed and sculpted artworks are a unique reflection of true nature of reality, humoristically parading as an endless cynical guffaw. Even though he mostly concentrates on Eastern issues, Yue’s works are also quite relatable to Westerners, which in return makes him extremely interesting for all the world’s art scenes and markets. The artist is represented by PACE GALLERY Beijing, PACE GALLERY Hong Kong, PACE GALLERY London, PACE GALLERY Menlo Park and WENG CONTEMPORARY. 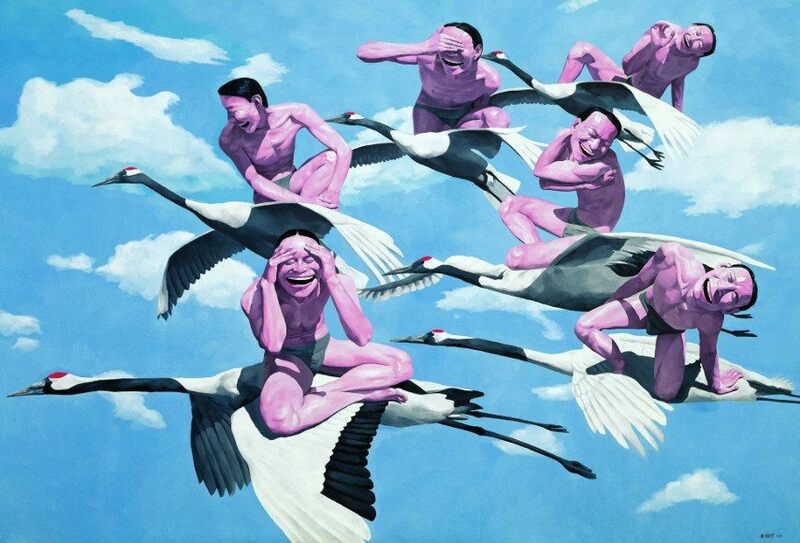 Yue Minjun lives and works in Beijing, China.